Jesus said to them, "There are many, many people to harvest (save). But there are only a few workers to help harvest them. God owns the harvest (people). Pray to God that he will send more workers to help gather his harvest." So often we wring our hands when messages about how all Christians should be evangelistic don't seem to make much difference. At times, we can get frustrated when so few people sign up for evangelism training classes. However, we often neglect the approach Jesus commanded: we need to pray for harvesters. Why do we have so few reaching out to the lost? 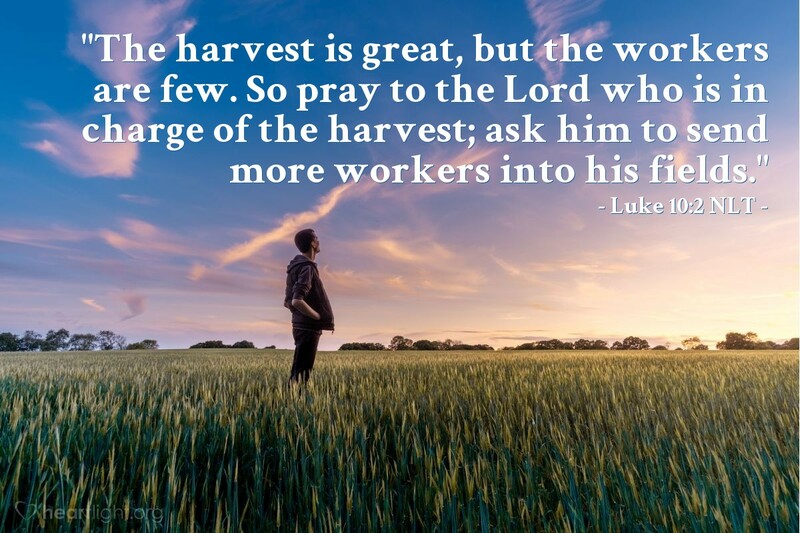 Could it be that we have not fervently and consistently prayed for the Lord to send out workers into his harvest fields? Holy and gracious God, please stir your people's hearts and open your people's eyes to the need of reaching the lost. Send out workers for the harvest. In Jesus' name. Amen.